We are pleased to announce that the fourth episode of Star Trek: Diplomatic Relations, “Détente” has been released and is available for listening and download. 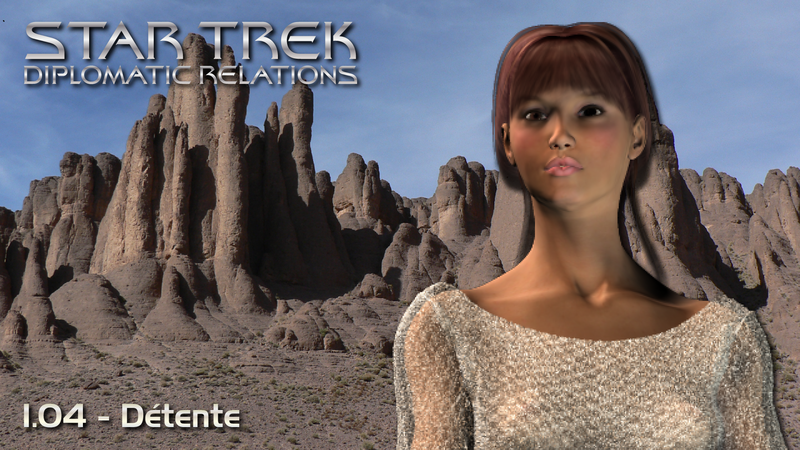 During a routine shuttle trip that goes disastrously wrong, Ambassador Kingsley, Lyta Brennen and Archduke Vren’Ka Li’Prit, cousin of her Royal Highness Mey’Lii, find themselves forced to rely on each other to survive a hostile area of Tahn’Los. Waiting for the High Curia and the Federation team to organize a rescue, the unlikely trio must survive not only a harsh environment, but the many predators of the night…. The series is based on Star Trek, created by Gene Roddenberry. The next episode of Star Trek: Diplomatic Relations, “Asylum” (DR 1.05), is currently in pre-production and is slated for release later this year. The episode can be listened to on its page. It can also be downloaded from its page on Spreaker, our audio hosting provider – just click on the album artwork on the left of the player. Tagged audio, détente, diplomatic relations, new release.